Fujinon 25X150 MT binoculars - Do You need them? The Fujinon 25X150 MT binoculars are a favorite for many who are interested in or have a need for clear, long-distance viewing. 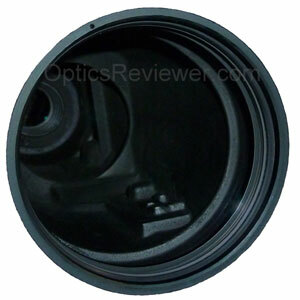 The optics include the expected BaK-4 (Porro) prisms and lenses which are fully multi-coated using Fujinon's patented "Electron Beam Coating" technology to optimize light transmission, protect the lenses against becoming clouded, and to provide lens coating resistance to a major enemy of lenses - salt water. While some of these features are taken for granted on higher quality binoculars, the Fujinon 25X100 MT is also Marine Tested to stand up to the rigors of use at sea or seaside. In a departure from the usual for many giant binoculars, they're waterproof and nitrogen gas purged to be internally fog-proof. Fujinon 25X150 MT binoculars are backed by the company's lifetime limited warranty. 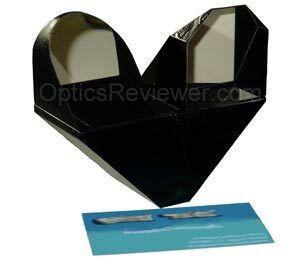 Eye relief with this individual focus instrument is a reasonable 18.6 mm and seems likely to accommodate most eyeglass wearers while not being so great as to cause problems. The interpupillary distance adjusts from 56-72 mm. To keep going with the technical information part of this review and get it out of the way, the field of view is 141ft at 1,000 yards (47m at 1,000m). While the field of view isn't outstanding for many optical configurations, it's actually not bad for a 25X150 binocular! The exit pupil is 6.0 mm, providing a calculated relative brightness index of 36.0. You'll not be able to view many things close at hand with this instrument as the close focus distance is nearly 56ft (17m). It's sometimes interesting to know who uses some of the less common optics. Those who use this binocular include a diverse group. Its excellent optics are keenly appreciated by astronomers as you might expect (more on that in a moment). It's also used by law enforcement for surveillance, the coast guard for protection of coastal areas as well as sea rescue operations, naval ships and by national border security agencies. We're also aware of commercial fishing vessels sometimes carrying as many as four of these binoculars to search the sky for flocks of birds because that shows a potential concentration of fish in the water beneath them. In fact, some fishermen using the SX binoculars, which are fully multi-coated using Fujinon's patented Electron Beam Coating technology, say they can see the circling birds up to 20 miles away - although they agree that it's only a good estimate of the distance. We find it largely believable, however, because of the incredible detail (resolution) and brightness provided by Fujinon with an approximate 90% of the field of view being crisp before the resolution fades to the outside edge of the image. A growing group of giant binocular users includes those who don't live right on the beach or shore, but want to be able to see what's going on and watch ships coming and going. Also, those who live on high places such as hills or mountains or on the plains or desert and like to be able to watch wildlife and the activities around them. As you adjust the azimuth and elevation you take note that, while they're not exactly light at 43 lbs (19.5 kg), they're well-balanced. You'll need to have a pedestal or tripod especially made to accommodate these binoculars - not all will be adequate. While these binoculars are nearly 38 inches (96.5 cm) long, about 7 inches (17.8 cm) of that length is taken up by the barrels extending past the objective lenses to limit the light entering the optics to that which is associated with the image being viewed. Our astronomer friends call that extra length "dew caps" for the binocular barrels since they help to prevent dew from settling on the objectives during night celestial viewing and they do serve that purpose well. The Fujinon 25X150 MT's optics provide for excellent light-gathering so that they'll be useful in both daylight and low light conditions. For astronomy, you'll find that these binoculars will "punch through" a lot of light pollution and allow you to see stars, galaxies, and nebulae you would not otherwise see. That's not to say that they won't do better without the light pollution, but to say that they're likely to exceed your expectations with it! You'll have a wide enough view of the sky that you'll be able to pick out patterns and the depth of view may leave you slack-jawed as you see images "come to life" in ways you've not previously observed. You'll be able to see entire groupings, clusters, and constellations with the three-dimensional effect available in binoculars and various filter options are available to further enhance your view. 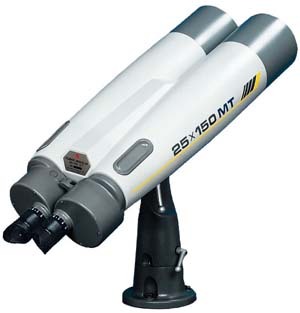 If you think of the Fujinon 25X150 MT binoculars as parallel six inch refractor telescopes with a 2.7° field of view, it may put things in a different perspective. It's safe to simply say that you'll be amazed by the number of stars, the three dimensional view, and the wide field of view. Be careful if you have any developing dental problems, though - drawing your breath in sharply can be painful if the cool nighttime air passes over sensitive teeth! For daytime land or marine viewing, we found that the Fujinon 25X150 MT made it possible to see an incredible amount of detail as far as 6 miles (10 km) away when viewing from an elevation so as to be able to have a straight line of sight. It wasn't a close-up view by any means, but it was enough to be able to have a very good idea, for example, of what people were doing. Under optimal conditions (no interference from rising heat waves, particles in the air, clear atmospheric conditions, etc), it's possible to tell a person's gender, hair color, etc, at 3 miles (4.8 km). Reading license plates? Under reasonable conditions, you should be able to read a license plate from as far away as 0.25 miles (0.4km) or more. For characters about three inches (7.5cm) high, that's pretty good! It's been our experience that no other retailers have been beating Amazon's pricing with comparable customer service. 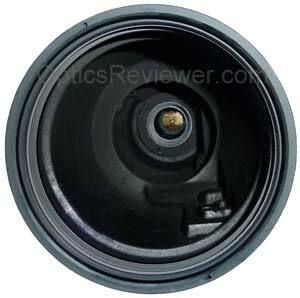 This link will take you directly to the Fujinon 25X150 MT at Amazon.com (USA) . If you're more budget conscious than you'd like to be and can't see how your budget can be manipulated to accommodate the Fujinon 25X150 MT, we recommend considering the Oberwerk 25X100 at Amazon.com (USA) . You can find it for significantly less than the price you'd pay for the Fujinon 25X150 MT. You'll not get the same view, but it's our opinion that you'll get a very good view for your money.